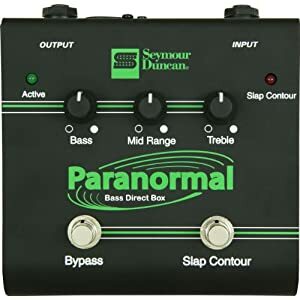 The Seymour Duncan SFX-06 Paranormal Bass EQ Direct Box is currently out of production, but there is a great deal going on at Amazon for this pedal. This pedal lists for $199, and is usually available for $139, but is currently on sale for only $49.99 at Amazon! At the time of this posting there were only four in stock, so if you’re thinking about picking this up, you’ll need to jump on it. While passive DIs proved to be quite useful for recording bass or sending bass to a console for live performance, people began to notice a decrease in overall response and punch. That’s when active DI’s came to the rescue. But how many are tailored to the response of a bass guitar? The Seymour Duncan SFX-06 Paranormal Bass EQ DI is, featuring a three-band active EQ that’s optimized for bass along with a contour switch for slapping styles. The three-band EQ allows you to dial in your tone in any room, sculpting your lows, mids, and highs quickly and easily. So, along with performing the normal functions of a DI, you get the benefit of adding an active EQ to your bass without having to make any modifications to your instrument. The EQ provides ±12dB boost and cut for each band, which have center frequencies at 30Hz for deep lows, 650Hz to contour the mids, and 5.2kHz for presence, clarity and attack. The SFX-6 also features Seymour Duncan’s proprietary Slap Contour switch, which applies an additional preset EQ curve. As the name implies, this is a dedicated switch for slapping styles, but it also adds an extra dimension to fingerstyle or pick playing. Slap Contour gives you a 6dB boost at 80Hz to bring out the bottom and cuts 6dB at 650Hz to reduce the mud that can occur in the low mids. The result is a solid low end and more room for attack. By using it with the 3-band EQ, you can bring out more attack information if needed, as well as extra bottom below 80Hz. Built like a tank with a 16-guage steel chassis and powered by either a single 9V battery or a regulated DC power supply, the SFX-06 features a balanced XLR output with ground lift to eliminate electromagnetic interference and AC-hum. Between that and its active electronics you can drive longer cable runs to a feed a front-of-house mixing board or a recording console without noise or signal loss. Again the Seymour Duncan SFX-06 Paranormal Bass EQ Direct Box is on sale for only $49.99! Crazy Deal on Behringer VB1 Vintage Dual Dynamic Filter at Amazon Awesome deal on the Carl Martin Bass Chorus Pedal Great price on the Seymour Duncan SFX-02 Tweak Fuzz Great deal on the Line 6 DM4 Distortion Modeler at Amazon.com! Best Wah on the Market Today?Loud Button WTF Give Away!